A food blog about classic recipes and the kind of cooking that we grew up with; we're also trying new recipes that may become tomorrow's classics! And just to add to the fun, you will find sewing or craft projects from time to time here at Yesterfood, too. These festive little cookies come together quickly by using mixes. Dress them up with some chocolate and nuts, and you have a fun treat with the great taste combination of chocolate and pistachio! 1. Preheat oven to 350 degrees. Line cookie sheets with parchment paper and set aside. Pour a thin layer of nuts on a plate and set aside. 2. In a large mixing bowl, combine cookie mix, pudding mix, and flour. Whisk to combine well. Set aside. 3. Whisk together cooled melted butter, eggs, and food coloring, if using. Pour butter mixture into dry ingredients and mix thoroughly. 4. Roll 2 tablespoon-size balls of dough. Flatten slightly, and roll edges in nuts. Place on prepared cookie sheets and bake until cookies are just barely beginning to get any golden color, about 9 minutes. Place cookie sheet on a wire rack and immediately push a chocolate kiss into the middle of each cookie, pushing about halfway down. 5. Let cookies cool on cookie sheet for about 5 minutes, then remove cookies onto wire rack to cool completely. Store tightly covered. Cook's notes: 1. The cookies are pretty without the added food coloring, they're just a very light shade of green. 2. The pistachios I used were roasted and salted. If you like a sweet/salty combination, you'll love it. If you don't care for sweet/salty, use pecans or walnuts. We go to these fun parties! Oh these look so yummy! I bought a TON of Valentine Kisses on sale after Valentine's day....now I can make these yummy cookies to use some. Thanks so much for sharing this recipe! Yum! Those look so pretty as well! Pistachios are very popular right now -- love all the Stephen Colbert commercials for them! Hi Joy, your cookies sound and look absolutely delicious. I'm a fan of almost every variety of nuts and just might have to make these cookies. I linked up my recipe here since the code did not work on my site. Joy, this are tasty sounding. Love to bake cookies. These have all the right stuff! Have a great weekend. Yum!!! I bet they're delicious! My son loves those kisses but I don't think we can get them in the UK - great recipe though. These look so pretty and sound delicious! My grandmother made a pistachio cake with pudding mix that was delicious, so I imagine these are yummy as well. Thanks so much for sharing. Pinned! I love pistachio pudding! I already have a cake I make with it, and now I can try these cookies, too! Thanks for the cute idea! These look so good! Such pretty photos as well. Thanks for sharing with Foodie Friends Friday! G'day! I felt like I was kissed by your cookies today Joy! View as party of this week's Foodie Friends Friends St Patrick's Day GREEN Recipes Party! Thanks also for all you do! These cookies are so stinkin' cute! Pistachio pudding is my favourite flavour of pudding. I'd love for you to come share at Simple Supper Tuesday. A new party starts every Monday night, so you still have time to link up this week! Joy, These look delicious and I'm pinning to my cookie board. Your photos are superb too! I love the way these cookies look and the pistachio flavor must be terrrific. So glad you brought them by foodie friday. These look heavenly! I love pistachio and the kisses look so pretty. These looks so yummy and sound so easy to make. I would love if you could stop by and share on my weekly recipe linky, Kids and a Mom in the Kitchen. These sweet treats look irresistible. Thanks so much for sharing at Weekend Potluck. Have a great week ahead and we'll look for you at next week's party. Ok, I need these cookies in my life - like NOW! Love making new cookies and I can't wait to give these ones a try. :) Thank you for sharing at #GetHimFed Fridays!! Your cookies look amazing! Thanks for linking up at The Four Seasons Blog Hop! Sandra from Scrumptilicious 4 You! I love anything with pistachio in it. Never seen cookies like this, can't wait to try them. 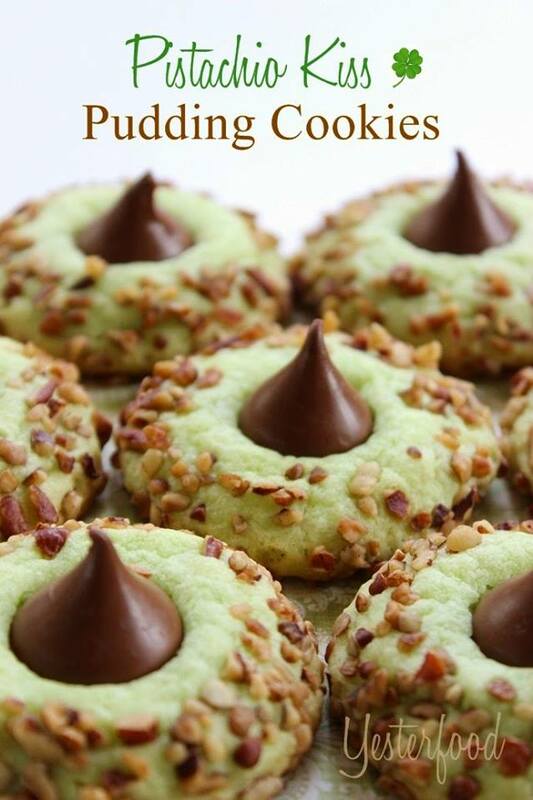 My husband is going to just love your Pistachio Kiss Pudding Cookies, he is a big pistachio fan. Thank you so much for sharing with Full Plate Thursday and hope you are having a great week. These look wonderful! As someone who is not a huge fan of mint I love the use of pistachio in a St. Patty's day dessert. Visiting from Friday Frenzy. My husband loves pistachio anything. I think these would definitely be a hit. Hi! Found this on Friday Frenzy. They look amazing! Great recipe! I RARELY comment on recipes, but these look AMAZING! I love pistachios and any recipe that uses pistachio pudding mix. I can't wait to try these! Thank you for stopping in and linking, Joy. I hope your husband is feeling better. These cookies are so pretty and I like the idea of using pistachio for St. Pat's. And of course, melty Hershey's kisses! These look so good! I love cookies with kisses in the middle and the addition of the pistachio pudding mix sounds like a great idea. Thanks for sharing - pinning. 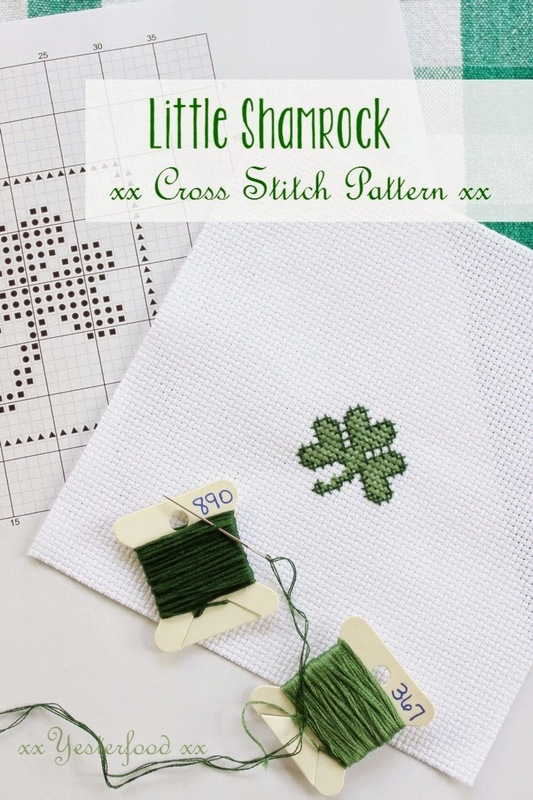 Pinning and can't wait to make. Thanks for sharing. I wish I good eat one right now! Sadly, we can't get pistachio instant pudding mix in my part of the world. If we could I would definitely be trying these cookies - they look gorgeous, and pistachio and chocolate is such a winning combination. I spotted this cookie picture last week and couldn't wait to find a spare moment to get over here and comment on it! I've been imagining the cool, refreshing taste ever since! My all-time favorite flavor is the peanut butter-chocolate kiss combination, but this one might just top that! And then you've made it so easy with the packaged pudding base. Would look great in a Christmas selection too if you missed last Monday! Having a very busy few weeks here, but I'm making these for sure as soon as I can! oh these look beautiful and I bet taste delish!! thanks for sharing with us! Pistachios are without a doubt one of my favorite things to eat. Pair them with chocolate and all I can say is ARE YOU KIDDING ME?? Didn't anybody tell you I'm on Weight Watchers?! Thank you for linking up your fabulous blog at our social media blog hop Joy! Great idea! They are so pretty and look so soft. I love your cookie recipes, always yummy and beautiful. Makes me want an old fashioned cookie jar! They look brilliant Joy, I love how you've added the chopped nuts around the edges. Thanks for linking up to Sweet and Savoury Sunday, stop by and link up with us again this weekend, I'd love to see you there :) Have a great weekend! This looks like so much fun! I bet the kids (and me) would love these. Thanks for sharing with us on Snickerdoodle Sunday! I love the pistachio pudding in these cookies! They sound so delicious! ohhh my god this Pistachio cookies looking so much pretty and delicious.color and flavor of it amazing.Thanks for sharing this much good food recipe. Pinned for St. Patrick's Day. These look so good. Double yum! I have a weakness for pistachios. Thanks for linking up to Funtastic Friday and sharing with us. Hope to see you again this week. I made these and a couple other kinds of cookies to bring into work for St. Patrick's day and these were gone way before the others. They were a hit! I used salted pistachios to roll them in and loved it. The combination of sweet chewy sugar cookie, salty crunchy pistachios, and the hershey's kiss on top was fabulous. Will definitely be making these again, and I can't wait to experiment with other pudding flavors! Claire, thanks so much for letting us know how much you and your coworkers enjoyed these cookies! What a wonderful endorsement! :) I'm so glad they were a hit- they're one of my favorites, too! I made these for my family and my sister's family for Christmas. They were a HUGE HIT!!! Very soft and chewy packed with just the right amount of flavor! They were also fun to make with the kids. My nephew is on the Asperger's Spectrum and had a BLAST getting his little hands gooey and being able to eat the outcome :) I am going to attempt to make these again, just without them being the Kiss Cookies. I will also be making these again VERY SOON! :) My son and daughter have been begging to make them again :) Thank you for the wonderful recipe!! Mine flattened out more than yours, still tasted ok. The finely chopped nuts didn't adhere as well as photo shows. All content is property of Yesterfood. No sharing of content unless full credit is given. Powered by Blogger.